Minister for Defence Stephen Smith has announced the achievement of initial operating capability (IOC) for the RAAF’s KC-30A Multi-Role Tanker Transport (MRTT) platform as part of his speech opening the 2013 Avalon Airshow. 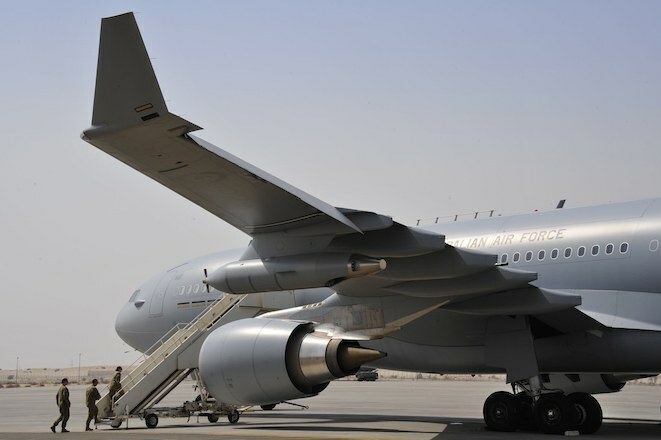 Speaking at the opening address for the Airshow, Smith highlighted recent advances in the RAAF’s airlift capability, saying Australia now boasts the “complete array” of tactical and heavy capabilities. “Today, I am pleased to announce that the KC-30A MRTT aircraft has reached IOC. The MRTT is designed to perform airborne refuelling for air combat aircraft to enhance endurance and range. The MRTT will also provide a further increase in Australia’s overall air lift capability,” he said. Following further modification and testing to the aircraft’s refueling boom as well as clearance tests for the F/A-18F Super Hornet, Defence expects final operating capability to be achieved in 2014. Australia accepted the fifth and final KC-30A MRTT aircraft from the Airbus Military facility in Madrid, Spain in December of 2012. Excellent – some more good news! New loan highlights the changing fortunes of Virgin Australia?